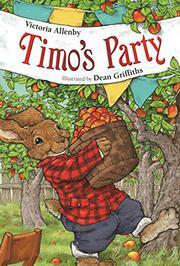 Apple-grower Timo hates parties, but to help a friend he overcomes his timidity and hosts an apple festival. Timo’s friend Hedgewick, an aspiring chef, wants to impress the influential travel writer/food critic who is coming to Toadstool Corners, so he enlists the rabbit’s reluctant help. The seven chapters introduce more anthropomorphic animal characters who help Timo develop the confidence he needs to make the event a success. Meanwhile, in an increasingly messy kitchen, Hedgewick is cooking up dozens of apple recipes. But while daydreaming about fame, Hedgewick burns the main course (apple-nut–stuffed squash). A simple apple-nut spinach salad saves the day. Full-color illustrations adorn almost every spread, breaking up the rather wordy text. Children making the transition from the controlled vocabulary of beginning readers to actual chapter books will find this a challenge, but the large, generously leaded type and generous use of white space make it more accessible. Hedgewick’s ambition to be the next top chef may be a stretch for young readers, but many will relate to Timo’s very human worries about his party skills. A recipe for apple banana cake appears on the final page.